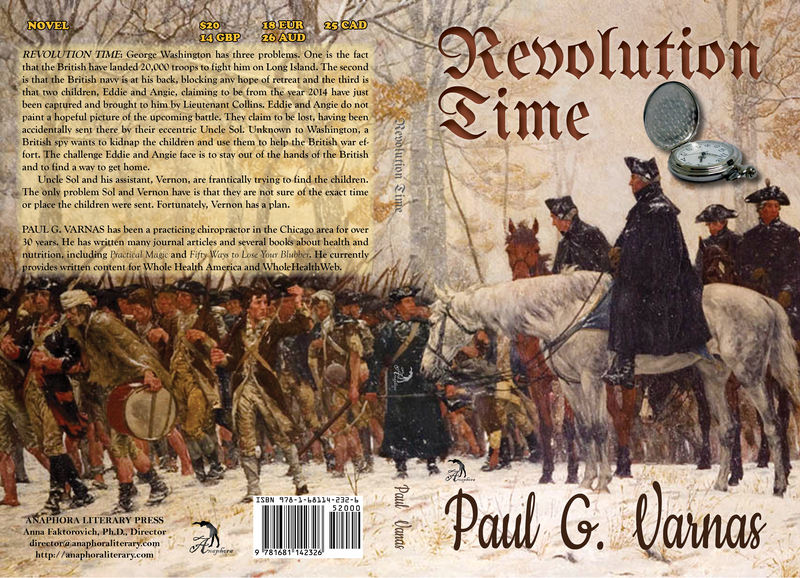 Revolution Time: ($20, 242pp, 6X9″, Paperback ISBN-13: 978-1-68114-232-6, $35: Hardcover ISBN-13: 978-1-68114-241-8, $2.99: EBSCO EBook ISBN: 978-1-68114-258-6, LCCN: 2016901305, April 2016; Purchase on Amazon or Barnes & Noble): George Washington has three problems. One is the fact that the British have landed 20,000 troops to fight him on Long Island. The second is that the British navy is at his back, blocking any hope of retreat and the third is that two children, Eddie and Angie, claiming to be from the year 2014 have just been captured and brought to him by Lieutenant Collins. Eddie and Angie do not paint a hopeful picture of the upcoming battle. They claim to be lost, having been accidentally sent there by their eccentric Uncle Sol. Unknown to Washington, a British spy wants to kidnap the children and use them to help the British war effort. The challenge Eddie and Angie face is to stay out of the hands of the British and to find a way to get home. Uncle Sol and his assistant, Vernon, are frantically trying to find the children. The only problem Sol and Vernon have is that they are not sure of the exact time or place the children were sent. Fortunately, Vernon has a plan. Paul G. Varnas has been a practicing chiropractor in the Chicago area for over 30 years. He has written many journal articles and several books about health and nutrition, including Practical Magic and Fifty Ways to Lose Your Blubber. He currently provides written content for Whole Health America and WholeHealthWeb.com.